Nine people have been arrested over allegations of fraud in connection with the Grenfell Tower fire. Eight men and one woman were detained by officers during raids at about 07:00 BST at 11 addresses, mainly in west London, the Met Police said. In a briefing, the force said two of the people arrested are linked but that all of the alleged offences are separate. The value of the alleged frauds range from £25,000 to £100,000. "All those arrests are in connection with what we believe to be fraudulent claims for housing and/or support of one kind or another, arising out of false claims from people that they were associated with Grenfell Tower," Det Supt Matt Bonner said. Three fraudsters have already been jailed for offences relating to the tower block fire in June last year that led to the deaths of 72 people. Joyce Msokeri said she lost her husband and her home to the blaze to obtain donations. Mohammad Gamoota pretended a real victim of the fire was his father while Anh Nhu Nguyen made about £12,500 by pretending his wife and son had been killed. 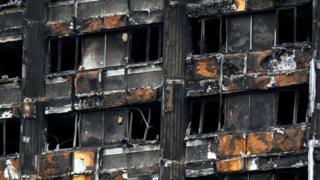 Two more people are due to be sentenced on 13 June after claiming to have lived on the 19th floor of the tower. Responding to latest arrests, campaign group Grenfell United said there is "no place" for fraudsters in the tower block's "good, decent" community. Chair Shahin Sadafi added: "It is hurtful and saddening that people would take advantage of a tragedy like this." A public inquiry into the fire is under way. Alongside that it was announced earlier that police are investigating London Fire Brigade's use of a "stay put" policy during the blaze.